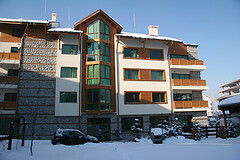 We have two luxury apartments available to rent in the Kandahar apartment block in Bansko, only 150m from the main gondola ski lift – so you’ll have no need to lug your equipment too far or wait for a shuttle bus. Each apartment sleeps up to 3 adults or a family of 4 and comes with all mod-cons including TV and DVD, fitted kitchen and bathroom with bath and shower. Between the two apartments (a studio and a one-bedroom), we can accommodate up to 8 people. Kandahar is a small, friendly block, manned by English speaking staff. Families can take advantage of the on-site creche and one of the most popular bars in town; Harry’s Bar is on the ground floor. As part of our service to guests, we offer a full transfer service to and from Sofia. Kandahar also has a leading British Ski and Snowboard school, Method, based on the ground floor. They have a shop selling the latest gear and offer lessons from top UK instructors. The studio apartment is number B4 on the first floor and includes a large balcony with scenic views. It is 50m2. 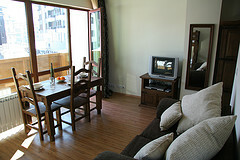 The living area is fully furnished with dining table and chairs to seat 4, TV and DVD. There is a wardrobe and boot rack in the hallway. The sleeping area consists of very comfy adult bunk beds and a sofa bed. The studio is perfect for friends sharing or a couple. The one bedroom apartment is number B11 on the second floor. It is 60m2. 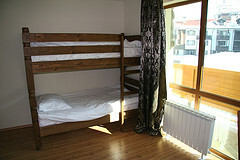 The apartment has a good sized double bedroom with comfy double bed and wardrobe. 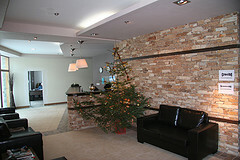 The lounge area is fully furnished with TV and DVD, dining table and chairs and a sofa bed. There is a boot rack in the hallway. The bathrooms have both a shower and bath to ease aching limbs. They come with a hairdryer, heated towel rail and shaver point. All towels are provided for guests and changed regularly. The kitchens are open plan and have everything needed for self-catering including all utensils, pans, cutlery, crockery and microwave. Appliances include kettle, toaster and fridge. Kandahar is a small, friendly block, manned by English speaking staff. Families can take advantage of the on-site crÃ¨che and one of the most popular bars in town; Harry’s Bar is on the ground floor. As part of our service to guests, we offer a full transfer service to and from Sofia.